A giant jellyfish-inspired artwork which was created by students from a Cheshire high school is to go on public display here at Blue Planet Aquarium. 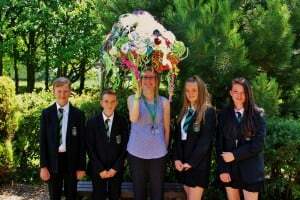 The design, which uses an umbrella frame to create the jellyfish’s body, was produced by Year 8 pupils at Neston High School. We plan to put the artwork on show in their Venom display area; alongside the jellyfish which inspired the piece. “At the start of the academic year our zoological team commissioned the students to devise a marine-themed textile artwork using some of the aquarium’s inhabitants as inspiration,” said Blue Planet Aquarium’s Phil Jones. “We wanted something which would ultimately go on public display here but that also contributed practically to the curriculum. “The team could not be more pleased with the finished work of art and we are looking forward to seeing it on show next to its real-life inspiration,” he added. The project is part of Blue Planet Aquarium’s on-going outreach programme with local educational and community groups. “The pupils have created a fantastic piece of art, they recycled fabrics to make the shape, then used an umbrella for the frame,” said teacher Mrs Andrea Holden. “The brief was to look at octopus and jellyfish and the finished article looks fantastic and shows great flair and imagination,” she added. Blue Planet Aquarium, Longlooms Road, Cheshire Oaks CH65 9LF. Open daily from 10am. For details call 0151 357 8804, visit www.blueplanetaquarium.com or find us on Facebook. Issued by Blue Planet Aquarium. For more information and to arrange picture, filming or interview opportunities please contact Phil Jones on 0151 357 8806. PICTURE CAPTION: Pictured with the completed ‘jellyfish’ are Adam Grove, Matthew Saunders, Eliza Brown and Ciara Moore-Jones, who are from the two year 8 groups who produced the artwork.